This chapter made bookmarks and collected books for an elementary class. Mimi Oxman and Ginny Taylor delivered the books and surprised the teacher and his teaching partner. 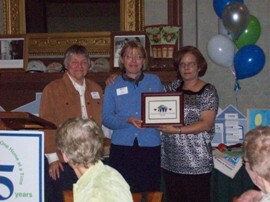 Members completed over 215 Habitat for Humanity samplers and are working on Project Linus. They have stitched an Alice in Redwork quilt. Members collected and delivered to the hospital needle art projects and craft materials for family members of patients at the Children's Hospital. They donated threads, needles, coloring books, paper, crayons, puzzles, crossword book, etc. Members made stitching kits to be distributed at the local hospital to patients and visitors who have long stays. They also donated food and personal hygiene products to the local food pantry at Christmas. Members donated many handmade Christmas onaments for the trees at the Marie Butler House which is registered with the Indiana Historical Landmarks Association. 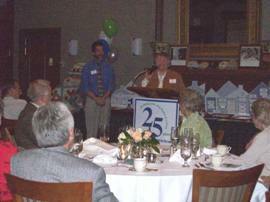 Habitat for Humanity: This year, 2008, was the 25th anniversary of the local Habitat for Humanity unit. 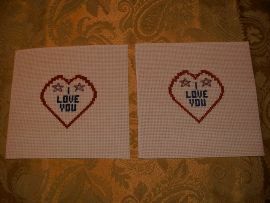 In celebration of that, samplers were stitched for presentation to the families at their home dedication this year. There were nine families identified to receive homes this year and thus a personalized sampler (with the family's name). The project chair, Linda Kanamueller, also stitched a sampler, which was presented to Habitat for Humanity, to hang in their offices. Nine of the Chapter members spent a total of 107.5 hours on the project. The project was funded by one Chapter member - $66.17 (which included the framing of the samplers). There has been a representative from the local EGA Chapter present at the dedications to make the presentation. The pattern was the Habitat for Humanity national logo with modifications that were made locally by the Habitat for Humanity with the Community Outreach Chair. Patriotic Kissing Pillows: The project was organized by Sandy Bogema. This is the first year our Chapter participated in this project coordinated by the Yellow Rose Chapter in Texas. We stitched up the pillow tops and sent the tops to the Yellow Rose Chapter for completion. This year we sent 75 stitched pillow tops. The fourteen members (about 45% of the membership) who were involved in stitching the tops spent 235.5 hours stitching them. The cost of the project was underwritten by a member and totaled $25.26 this year. If there is interest in this project again, it may be repeated next year. The pattern and design was developed by the Yellow Rose Chapter. When our members received the pattern, they also received some fabric on which to stitch. Thus the pillow tops were all alike. Angel Gown Project: The project was organized by Judy Marks. Babies in the neonatal unit and their families, also parents and families of deceased babies benefited from the project. The hospital's requested the gowns be made of flannel to protect the fragility of the babies' skin. The gowns are often among the keepsakes the family has of the deceased baby. 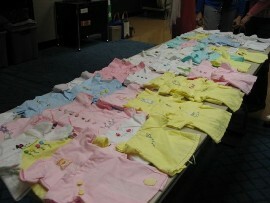 In the neonatal unit, the gowns are used on the babies and their tubes to bring more normalcy to the situation. They also protect the baby's skin when held by parents. This is an on going project with a total of 70 gowns delivered in November 2008 to the two Regional Hospitals in Kalamazoo. A few members cut and sewed the gowns which were made from pastel flannel. The gowns were then enhanced at stitch ins for EGA members held ten times during the year at a local shop. Eight Chapter members worked on this project. Eighty-six hours 25 minutes were reported for cutting, and sewing the gowns. There were eight-two hours 45 minutes spent on enhancing the gowns. The enhancement techniques included hardanger, various stitches to make designs, various border stitches and incorporating small buttons and applique's in a design. This year there was no additional money added to the project. Supplies used were what was purchased fall 2007. A local fabric store has their huge anniversary sale in November. The pattern used was a modified commercial pattern for a new born gown. During the year more modifications were made at the suggestion of one of the hospitals. These included making sleeves larger (wider) and adding length to the gowns. The pattern will be further modified the end of the year after a meeting with the hospital Director of Women and Children. The Festival of Trees is sponsored by the Junior League of Kalamazoo. This is a large money maker for them from which they fund their community projects including grants to local agencies. Local groups and individuals design and decorate Christmas trees, wreaths, and gingerbread houses which are sold by silent auction to attendees. The Kalamazoo Chapter EGA has sponsored and decorated a tree and/or wreath since the beginning of this event (about 19 years ago). Through participation in this community event the local chapter receives some publicity as each tree is identified by sponsor and who decorated it. Members donated $50 to the Brooks Memorial Fountain Restoration Project, they also gave a donation to the Climax library for bookmarks for a summer student program. They donated cleaning supplies to the local Ronald McDonald House. They donated toiletries, mittens, socks, underwear, etc. to the homeless shelter in December. They made and sent 100 kissing pillows to our soldiers. This chapter has been stitching a sampler each year and this is their third one. The sale proceeds from this sampler help support the Reclaiming our Heritage Civil War School Day. Members donated food for the food pantry at Christmas. They provided 42 large boxes of crayons to their local children's hospital at the hospital's request. Members designed a project, kitted it, and taught it at Camp Quality Illinois 2008. The children made bookmarks. The remaining kits were donated to the Camp. Members who participated in this project were Marjorie Holmes, Sue Dahlkamp, Joyce Kinnally, Carol Parry, Karen Pinta, Pam Schoppyoung. Pat Bellinger. GLR donated tassels left over from Seminar 2007. During Open Art Days at the Toledo Botanical Garden, members of the guild had the opportunity to work with area children on a plastic canvas needlepoint project. The children were able to pick out their own colors for a fish project. Each little girl left with a completed fish necklace or ornament, complete with "google eyes". They were given enough materials to make another one at home. The project was organized by Anna Kerlin. She and Annette Hill supplied materials. Pattern is available to other chapters. This project was just right for a walk in type of class with young non-stitchers. It was a very positive experience. NAGT has an ongoing project of delivering stitching kits to Brooks Medical Center for patients and family members of the military. They have sent over 800 kits so far. Members instructed and provided materials for plastic canvas stitching at a local retirement home. They also made kissing pillows for the military. Dolls were given free of charge to children facing special circumstances where a doll to hug could give them faith, love, joy and comfort. The chapter donated material and trims for making the dolls and clothes. Some members also made tote bags and doll blankets. The chapter also donated $250 for this project. The money was proceeds from a silent ornament auction. The dolls were designed and developed by Janet Householder. Members knitted 301 baby caps to give to newborns at the Covenant Healthcare Neonatal Center. Thanks to the generosity of DMC, Windy City EGA members provided kits, samples and instruction to all who attended their Color Your Winter with Crafts Event last February. They teamed with Windy City Knitting Guild. They gave away lots of brochures and several of their chapter scissor fob kits. Marlene Thomasello taught silk ribbon embroidery, Sally McDavid and Shelby Ricci helped set up and provided instruction in cross stitch and embroidery. Joyce Block took the lead for demonstrating a counted dross stitch bookmark. Nina Savar, who masterminded and spearheaded the whole event, did a great job with outreach for all the fiber arts. Stitching along through the day were Dorothy Kilian, Pat Chromy, Pat Morrow, Bjornson and Jackie Alton. Members stitched and framed 3 Habitat for Humanity samplers with all materials donated by members. Members made Totes for Tots (37 bags). These totes were white quilted bags lined with colorful fabrics and filled with coloring books, crayons, glue, scissors, construction paper and stuffed toys. These totes were given to children at local Akron children's hospitals.